Some musicians, when making albums, prefer to stay alone, to express their personal feelings in musical form on their own ways. And in some cases, to deal with them (as a writer) is not an easy task. 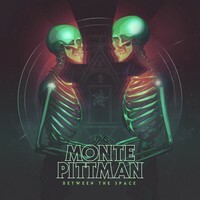 MONTE PITTMAN’s new album, “Between the Space” is a fine example of what my words mean. Monte is known for his guitar playing for MADONNA live shows and for his work for PRONG (he co-wrote songs on “Scorpio Rising” and “Power of the Damager”). So you can expect an album that is different: filled with modern melodies and energy, with solid songs in every aspect, but still charming and really spontaneous. Nothing on “Between the Space” sounds forced but be prepared to hear a form of music rich in different influences, so when you think you’re hearing something that would fit on Alternative Rock scene, or even on modern Hard Rock or something in this way, another track of the album can change the rules. So, it’s a real trial as a writer, but a pleasure as a fan. Monte, as we could expect, recorded and made the mixing of “Between the Space”, leaving the mastering to Alan Douches. And the final result is an album that sounds abrasive, modern and heavy, but clean in a way that all melodies can be understood even by the dumbest man alive. Yes, everything is truly sounding great! On the songs, everything was done in a straight way. No song of this album sounds complex, but they aren’t simplistic. So be prepared, because the aggressive insight of “Evidence” and “Ominous/Hope” (what a lovely chorus on this one), the catchy rhythm of “Changing of the Guard” (some arrangements on the guitars can remind from melodic Thrash Metal, but soon Modern metal traces can be heard on many parts), the charming tender harmonies that fill “Once Upon a Time”, and the abrasive modern aggressiveness of “Reverse Magnetism” will take you by force. So, we can say that Monte needs to stay active, because albums as “Between the Space” are precious jewels for the Metal fans. Hear it, then put “Better or Worse” to spin, and enjoy the experience!